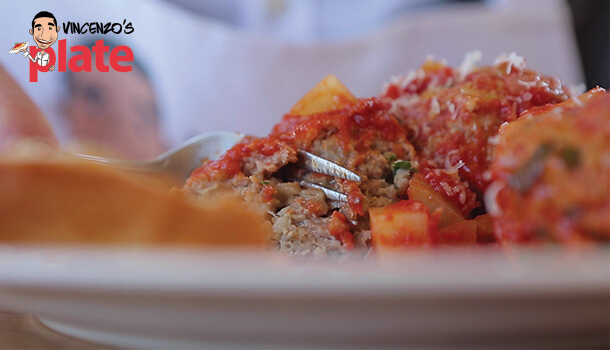 Italian Meatballs are part of the Bible of Italian food. They are one of those dishes you simply MUST learn how to make, and once you find a recipe you love, you will be making meatballs every chance you get. My meatballs recipe is tender, juicy and bursting with flavour (and the accompanying sauce is finger licking good too!). 1. Cut the crusts from the bread slices and put the white parts, whole, into the bowl of water. 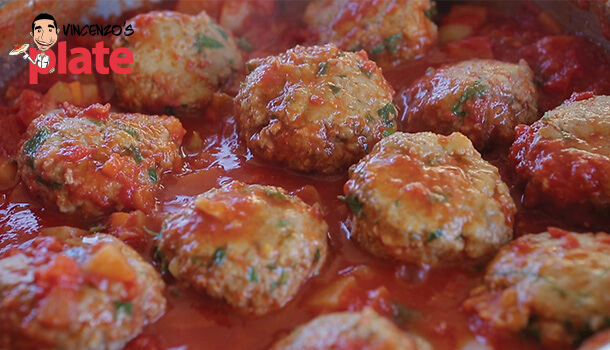 Vincenzo's Tip: Bread is the secret to making the meatballs super soft so don't miss this step. 2. Fill the medium size pot with water, dropping the chopped potatoes inside. Place it on the stove and leave to boil at a medium heat. 3. Once this begins boiling, leave it to cook for 10 minutes (watch that they don't overcook as you don't want them to be "smashed potatoes!"). 4. Drain the potatoes into a colander, getting rid of any excess water and leave them to the side. If they are ready well ahead of time, rinse them under cold water for a couple of minutes to stop the cooking process any further. 1. Put one of the pans on to the stove at a medium heat and drizzle 4 tablespoons of extra virgin olive oil into it. 2. Add onion, celery and carrot and stir fry until they begin to turn lightly golden, stirring them regularly. 3. Once they begin to colour (after approx. 5 minutes) add the finely chopped tomoatoes, one can at a time. 4. Stir this through well, letting it cook for another 5 minutes then turn the heat down to low and add half of the chopped parsley (you can also use Basil instead). 5. Stir the parsley into the mixture then cover it. 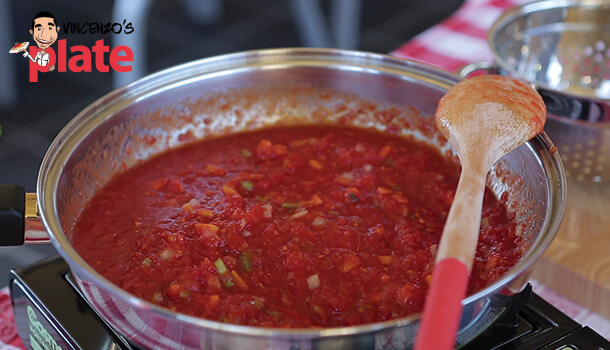 Return to stir every so often so all the flavours infuse into the sauce. 1. Put the mince into a bowl and using a fork, press down on the meat with the bottom of it, turning it over and repeating. 2. Crack four eggs into the mixture, beat them well and mix them into the meat. 3. Chop the garlic cloves really fine, and chop up the remaining parsley a little more before adding both to the mince. 4. Next, add 4 tablespoons of breadcrumbs and mix well. 5. Grate 150g of Parmigiano Reggiano on top. 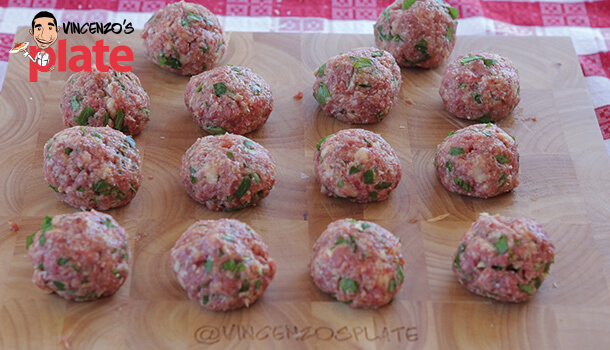 Vincenzo's Plate: Be sure to buy a fresh piece instead of the one that is already grated as it's bound to add a much richer flavour to your meatballs due to the thickness and texture. 6. 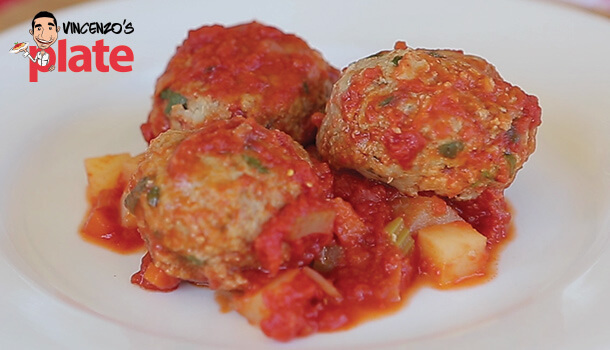 Squeeze all of the excess water out of the pieces of bread and then break each one into small pieces and add it to your meatballs mix too. 7. Sprinkle some salt and pepper over the top and mix everything together with a fork. 8. Now it's time to assemble! 1. Get a palm full of ingredients (or less, depending on the size you want to make) and roll them into a ball. 2. Make as many meatballs as you can using all of your mixture and try to make them all more or less the same size as this will ensure they all cook through at the same time. Vincenzo's Tip: Keep a small bowl of water nearby as in between making each one, you might need to dampen your hands a little to stop anything from sticking to them. 5. By now, your potatoes should be cooked and you can remove the lid from the sauce and add them in. Carefully stir them through and pur the lid on again. 6. 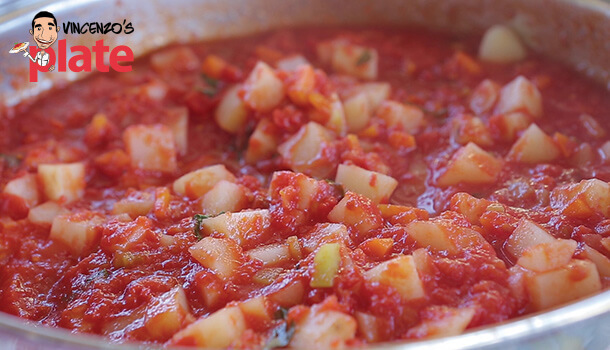 Add 4 tablespoons on evoo to another non-stick pan and put it on the stove turned on to a low heat. 7. 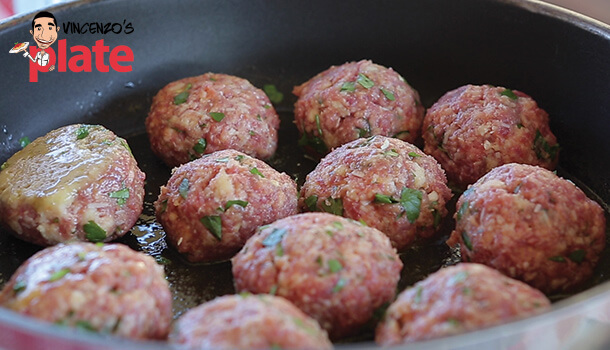 Place each individual meatball in the pan and after 1-2 minutes, using a fork, gently nudge each one to make sure it is not sticking to the pan. 8. A minute or so later, check that the bottom of the first meatball you dropped in has started to brown. If it has, turn it over (along with all the others) so the other side begins to cook too. 9. Once all of the meatballs are brown on both sides, gently lift each one up and put it into the pan where your sugo and potatoes are cooking. 11. Cook these for around 5-6 minutes then gently turn each one and let them simmer for another 10 minutes. 1. 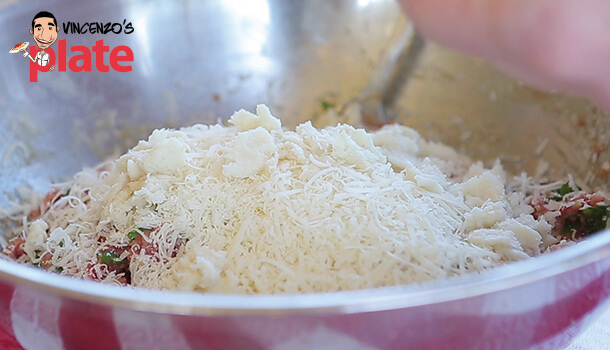 Scoop out at least 3 Italian meatballs per sere and simply sprinkle some Parmigiano cheese on top. Enjoy them with some warm crusty bread on the side...and make sure you have seconds! !